In the above diagram the upper graph is a "proxy" record of global average temperature as determined from isotope ratios in ice cores taken from Dome C in central Antarctica. The temperatures shown here correspond quite closely to proxy temperatures derived from ice cores in other places in Antarctica and, for the last 120 ky with ice core temperatures in Greenland. The horizontal scale shows the last 500 ky BP ("before present"), i.e. the last half million years. The vertical scale shows the temperature difference relative to present day temperature which is shown as a horizontal dashed line. The orthodox theory of ice-ages was proposed by Milankovic around 1912. He suggested that the ice age cycles were controlled by wobbles in the earth's orbit around the sun. These wobbles (orbital variations) resulted in differing amounts of solar energy being received at certain critical latitudes in the Northern Hemisphere in different epochs. The critical latitudes being around 60 degrees North, at the edge of the NH ice sheet. Thus when more sunlight arrives the ice will tend to melt and the ice sheet to shrink, at other times the ice sheet will grow. In this way the orbital variations are said "drive" the ice-ages. The lower graph shows the total insolation energy received at 60 degrees North as calculated by celestial mechanics. It can be seen that there are tantalizing correspondences between peaks and troughs but the two graphs are not well correlated. It is certainly not an open and shut case. 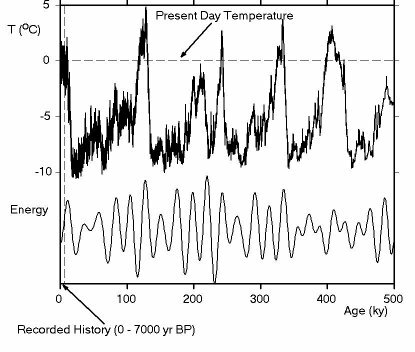 The ice-age temperature has a continuous power law spectrum which falls off as inverse square of frequency. This implies that it is the outcome of a "random walk" process (i.e. like Brownian motion). Once the power law property is removed orbital forcing accounts for less 1.4 percent of the variance of the temperature time series. Hence orbital variations are no more than a trigger or pacemaker of ice-ages rather than a strict forcing as proposed by Milankovic. Beryllium 10 fluxes due to solar and geomagnetic modulation of cosmic rays indicate that some temperature variations are controlled by an, as yet unknown, external forcing unrelated to orbital variations. The deterministic/stochastic dichotomy is important here. The temperature graph is stochastic but orbital variations are driven by celestial mechanics and are therefore deterministic in nature. This work has been submitted to Journal of Climate and is presently under review. A preprint may be downloaded here (PDF 566 kB).